Friday, May 10th, 2013, Queer Girl Gets Married. What juxtaposed with the fanfare was the casual nature of the crowd. Many of them came dressed down in jeans and sweatshirts. Now, I understand that this is common Chinese practice. The wedding participants dress up; the attendees dress down. At the time, though, I felt vaguely irritated by this, as though our event were not worthy of some fancy duds. It was my cultural expectations seeping in. What a trip to see my father in a tuxedo next to those who didn’t bother to wear clothing with buttons, though! The other aspect of the main wedding day that left a deep impression was that most of the guests spent the majority of the ceremony talking or eating. I remember noticing that only the front two tables were really listening to the Chinese speech that I’d painstakingly memorized in the wee hours of the night before. It was my largest “gig” in China, yet I didn’t have the crowd’s attention. When my parents spoke in English, I was even more embarrassed by the chattering, negligent crowd. They had a translator, but her Chinese version of their words didn’t command any more of their attention. A smaller affair may have garnered more respectful attentiveness, but this event was enormous. There were 420+ attendees, let’s not forget. That many attendees were testimony to the decades of contacts and relationships his parents had developed over the years. Their attendance rather than their attention was meant to convey community support. I had to just accept that. After the ceremony was over, we went around to each table to clink glasses with all the guests. This is an essential part of every Chinese wedding and usually involves sharing alcohol, but we improvised with a wine bottle filled with grape juice. By the time we were done, I turned around to find the place was nearly empty. We had only spent less than five minutes at each table (that sat twelve), so I was surprised that an 8-course meal had been consumed so quickly. Then I remembered that everyone had been eating during the speeches, ring exchange, cake cutting, (etc). So, as soon as they’d paid their respects to us as a couple, they were gone! It was barely 4 in the afternoon. We hadn’t had a chance to eat, but I had no interest in the piles of meat that were on offer. My vegetarian heart ached at the sight of it, especially when so much of it got wasted. Aside: if the point of the animal’s death is to be eaten by humans, isn’t throwing it away uneaten the ultimate insult to its life? 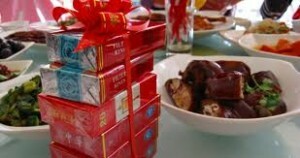 And let’s not even talk about the smoking—a part of Chinese weddings condoned and encouraged. That comes from the word “xi” 吸 (or “to inhale”) having the same sound as the word for happiness: “xi” 喜. Thus, when one smokes at a wedding, one is supposed to be wishing the couple happiness. Hosts providing cigarettes to the guests has been part of the Chinese wedding tradition for years, but I found myself muttering under my breath that it was a miserable way to wish someone happiness—blowing second hand smoke into our lungs so that cancer can creep up on our happy matrimony, decreasing our number of future years together. So, with so much meat and smoke on offer, needless to say, I had no appetite. These were just part of things that I’d had to accept. As you all know, this wasn’t our event; it was his parents’. Then, after the casual meal, we all went and sang some karaoke after dinner. That’s about all I remember. It was probably one of the weirdest, most surreal days of my life. Part of me thinks that someone else was wearing the wedding gown(s) and it was some other ‘hairsprayed’ bride that was squinting under the spotlights. I know I was a prop in someone else’s play and that only my physical presence was necessary, but to compensate for the absence of all control, I think I had a sort of out-of-body experience that day. I watched in wonder from the sidelines and my on-looking self was shaking her head at the situation I’d found myself in. That was the moment I cherish most from my first (and main) wedding day. That’s the grounding a mother’s look can give. It happened long after the actual event was over but was the first moment on my wedding day when I felt the fullness of real recognition.